Leading Manufacturer, Suppliers and Exporter from Surat, our product range includes Patiala Suit such as Cotton Patiala Suit, Printed Patiala Suit, Fancy Patiala Suit and Embroidery Patiala Suit. Stylish Designer Patiala Salwar Suit with beautiful resham and heavy jari thread work on top, border and on back also. This beautiful designer suit is perfect for almost any joyous occasion like Party , Wedding , Festive. Our traditional roots combined with creative styling makes this dress material from KVS FAB !!!!..... a must have. 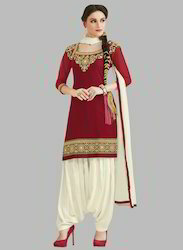 We recommend Cotton Embroidery Suit, Patiala Salwar Kameez, Punjabi Suit, Fashion Salwar Kameez, Ladies Suits. completing the look with matching heels and beautiful dangler earrings to that extra edge to your look. Our product range includes a wide range of Designer Dresses Suit such as Churidar Salwar Kameez, Georgette Anarkali Suit, Semi Georgette Salwar Suit and Semi Georgette Salwar Suit. Grab all the attention of your onlookers by cladding into the beautiful straight cut cotton designer salwar kameez. This Blue color designer dress material is further adorned with fancy zari and resham embroidery work that reflects the charm of the outfit. The dress comes along with cotton bottom and chiffon dupatta.Note: Slight variation in actual color vs.image is possible. Fashion charm pattern brings flashy patterns on fabric which turns even shades of colors brings opulence back to your season dressing. Give to glamorous touch to your personality with blend of charming hues. This Red and Yellow color un-stitched salwar suit is gracefully adorned with embroidery work that highlights the ethnicity of the attire. This dress material comes along with Red color pure cotton kameez, Yellow pure santoon fabric bottom and chiffon dupatta. The bust size of kameez can be custom stitched upto 42 inches. Fashion charm pattern brings flashy patterns on fabric which turns even shades of colors brings opulence back to your season dressing. Give to glamorous touch to your personality with blend of charming hues. This Red and Yellow color un-stitched salwar suit is gracefully adorned with embroidery work that highlights the ethnicity of the attire. This dress material comes along with Red color pure cotton kameez, Yellow pure shantoon fabric bottom and chiffon dupatta. The bust size of kameez can be custom stitched upto 42 inches.